Something that was missing in online reputation management for hotels was a way to calculate the aggregate rating of a property or brand across the diverse range of guest review websites. 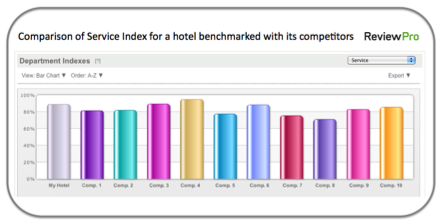 This is why one of the first things we did at ReviewPro was create the Global Review Index (GRI), which provides a score reflecting a hotel’s overall online reputation. It is quickly becoming the industry benchmark for online guest satisfaction. When looking at online reviews, it is critical to gain a clear overview of how a hotel is being rated across the multitude of review sites and Online Travel Agencies (OTAs). You can manually go to a few leading review sites or OTAs and look at your ratings, but the influence of reviews stretches much further. Increasingly, there is greater fragmentation of sources as virtually all OTAs now offer user reviews. There is no doubt about the impact of global players like TripAdvisor, Expedia and Booking. There is, however, a growing importance of regional OTAs such as HolidayCheck, Venere, Atrapalo, etc. While many hoteliers may not be familiar with these sites, they are leading sources where consumers research and reserve hotels in their respective markets. And, just because you are number two in your city on TripAdvisor does not necessarily mean that you rank equally as high on all of the other sites. Not only is it tremendously time consuming and inefficient to check dozens of relevant review sites manually, but there is also the issue of rating systems – every site has its own rating system. TripAdvisor, for instance, works with a 5-point system for overall rating. Booking.com, on the other hand, works on a 10-point scale, and HolidayCheck users rate their experience on a 6-point scale. These different rating systems make it almost impossible to manually calculate a rating from all reviews taken together or to compare your hotel’s performance on different sources. All of these features are also offered on an individual source basis, meaning you could, for example, benchmark your performance with that of your competitors on Expedia only, or see how you rated over the last month on Booking. These Department Indexes allow a hotel or chain to gain insight into their daily operations and see which areas they are strong in and where they need to improve. You can visualize the evolution in each of these areas to quickly flag problems and identify areas for improvement. The indexes can also be used as indicators if you discover a significant change in the GRI: Looking at the performance of each department helps determine what caused the GRI to increase or decrease. As Sandro Lucarini of Campus Cerdanya put it, “ReviewPro offers hotels the equivalent of a quality repartment in a box”. Our clients are using the Global Review Index in various ways. For example, we offer a reporting feature that automatically generates an Executive Summary Report. This report highlights significant changes in the GRI, Department Indexes and other key indicators and can be emailed and shared with anyone in the organization. Many chains have the General Manager for each of their properties provide a weekly review showing changes in the GRI and explaining how they improved it or, in case the score dropped, explain what issues caused the score to drop and how they are working on improving it again. Our automated reports are making this process effortless. You can also export the GRI data to Excel to cross-compare with other key data you already have, such as average daily rates or the number of staff members in the hotel. One of our clients was able to quantitatively link a decrease in guest satisfaction to a reduction in resources. Having fewer staff members available led to a decrease in guest satisfaction and in turn to a drop in the rankings of several leading online travel and review sites. Seeing this development early on, this client was able to rectify the situation before it could have a major long-term impact on revenue. Sol Meliá, the largest operator of holiday resorts and one of the largest hotel chains in the world, goes a step further and regularly exports their GRI data from ReviewPro to compare it with financial data like its average daily rates for each property. According to Manuel Riego, Director of Marketing Strategy & Loyalty for Sol Meliá, the chain is also looking into setting GRI targets for each property. Furthermore, Sol Meliá regularly looks into the department indexes for their hotels to see how they compare to their competitors in key concepts such as gastronomy and service. Several of our clients are now establishing specific goals for both the GRI and Department Indexes for individual properties in their chain and linking a part of hotel directors’ bonuses to achieving these goals. Lastly, many hotels, such as the Hotel Avenida Palace in Barcelona, are using our ReviewPro Quality Seal on their website. This allows them to display their GRI directly on their website, optionally with select guest reviews beside it. This level of transparency increases consumer trust and has led to an increase in direct bookings of up to 40% for clients that are using this option.